Smith-McDowell House is please d to be hosting a very special tea party for girls (ages 7 and up) and an adult on February 11, 2017. 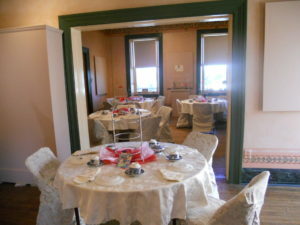 The tea party includes a program, high tea and a craft activity. The party will begin at 2:00pm and will last approximately 2 hours. The admission fee is $18 each child and each adult. All children must be accompanied by an adult. Reservations are required for this event, so please make reservations February 9, 2017. Reservations may be made by calling 253-9231 or using the Online Registration Form HERE. Arrangements for pre-payment will be made after you register. Crafty Historian events are held on the third Saturday of most months from 10:30 to 12:30. Reservations are required by Thursday prior to the event so that we will have enough supplies for everyone. Each event includes an educational, art-focused activity that stimulates creativity and interest in traditional crafts. Children 9 and older are welcome to attend without a parent (although parents are most welcome to stay and assist), and younger children must have an adult to help them. There is a minimal charge for each program based on the type of craft for the day. These events are wonderful opportunities for both parents/grandparents and children to experience history in a fun and interactive way. You can get on the children’s activity email list by emailing education@wnchistory.org. 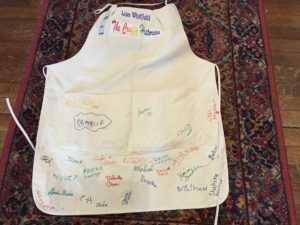 Crafty Historian participants get to sign the Crafty Historian apron! !